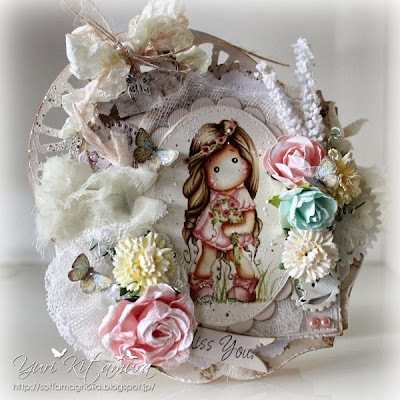 Today I would like to show you a card that I have made using this cute image from Magnolia, she is called Summer Wedding Tilda from the Special Moments Collection 2013. 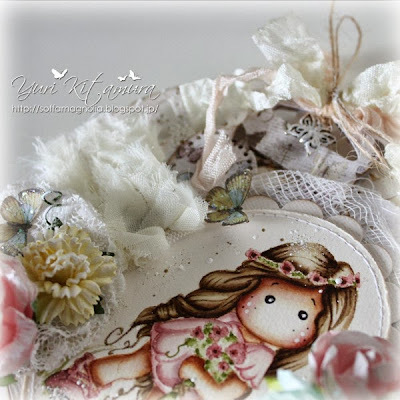 The sentiment stamp also from Magnolia is called Miss You, from Bon Voyage Collection. The papers I have used are from Inkido and Maja design. The tiny butterflies are cut out from Inkido paper and added sparkle with Stardust Stickles. The metal charm, metal gears and flowers are painted with White Gesso. I have added Frantage - Shabby White around the image. 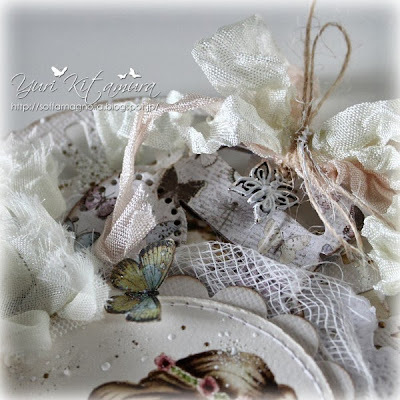 I have used Magnolia DooHickeys are So Wrapped Lovely and Christmas Tags. 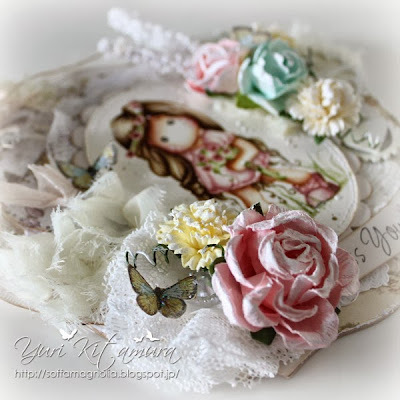 Other die is Wearhered Clock - Tim Holtz Sizzix. 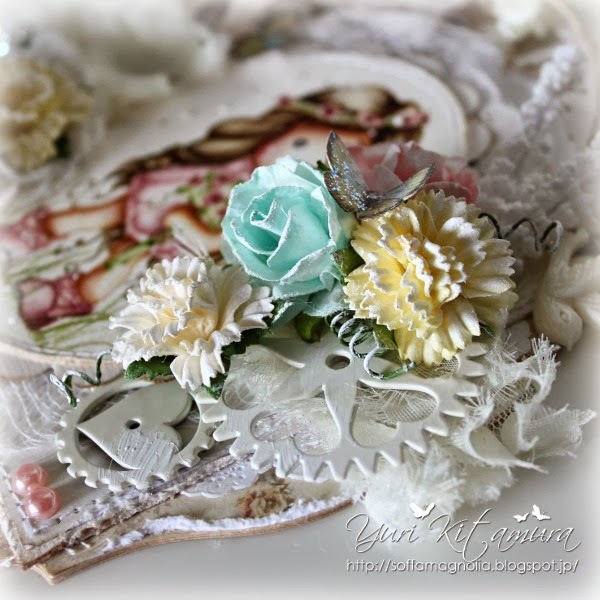 Pretty metal heart gears and fabric flower are from Prima. 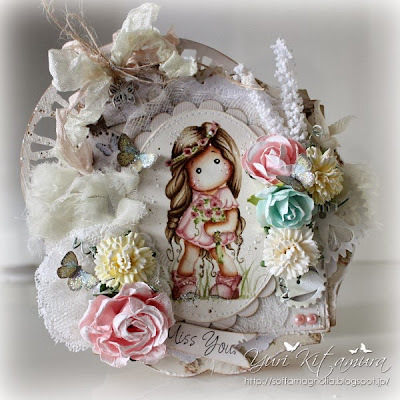 I used Go Kreate Large Frame Frilly #10 die for the shape of my card. Behind the image I have placed some cheesecloth. Carnation Ivory, Carnation Pale Yellow, Natural Button Twine, Pearls Sugar and Spice Self Adhesive, Ivory Resin Dove, Cheesecloth, White Seam Binding, Stickles Stardust. Magnolia Ink Magazine #5 2013 "Winter Wonderland"
This is so pretty Yuri. So many beautiful embellies. wow Yuri I love this card and how you did her hair!! Beautiful. I love the colours you chose. This is beautiful! Love all of the embellishments and the frantage. Thanks for sharing with us at Fashionista. This is absolutely beautiful Yuri. Your colouring is amazing and the details are simply wonderful. WOW Yuri!!!! I love it! Tilda is coloured absolutely amazing!!! I love no line technique!